Geoloqi-Powered ChatterCast Wins Seattle Open Government Hackathon! This weekend we participated in the Gnomedex10 Open Government 24 hour Hackathon. Tropo sponsored a lounge at the Edgewater hotel with food, coffee, wifi and couches for open data geeks to build apps in. 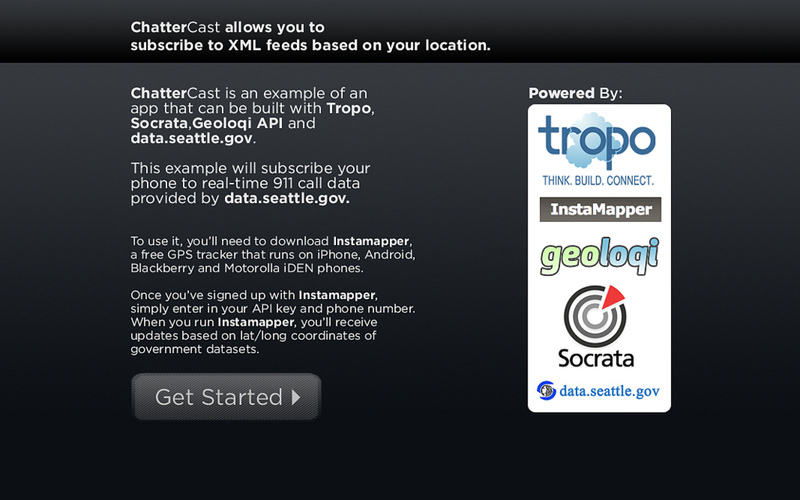 Participants were encouraged to make the best app using the Tropo API and data.seattle.gov (powered by Socrata). We quickly realized that we could use the Geoloqi API to build a local emergency alerter app that could run on almost any platform. In the span of around 5 hours (plus about 4 hours getting the Geoloqi API ready), we built ChatterCast, a app allowing one to subscribe to XML feeds based on one’s location. We used the Geonote methods of the Geoloqi API to handle delivering the location-specific messages. Geoloqi used Tropo to deliver SMS messages to the phone. We finished with just enough time to present before we had to catch our train back to Portland. We had to leave before we were able to see many of the other presenters. We caught about half of a great presentation by Portland geohackers and open gov enthusiasts Reid Beels and Max Ogden. Their app notified users the day before events happened in user-specified ‘watch zones’, e.g. road closures on your commute. 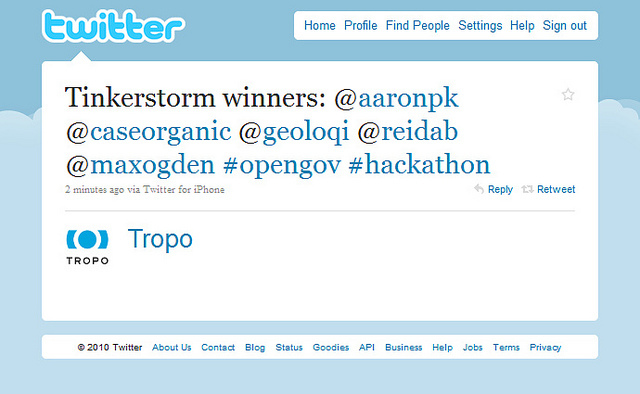 They won for best use of Tropo, another success for Portland’s open government community! Note that the app is simply a proof of concept. While it fully works, it requires installing Instamapper on your mobile phone. Instamapper runs on most mobile phones, including some older Motorola models such as the Boost Mobile phone. This means that even some users with older phones can still have access to this data with ChatterCast. If you’re unfamiliar with Instamapper, we wrote a post on it here. Here’s an example Geonote SMS message from the data.seattle.gov 911 call dataset. We had a great time building this app! Now we have a framework for digital storytelling and geolocal data. Anyone can use Tropo, Instamapper and the Geoloqi API to build their own app capable of pushing XML data to a user by SMS. We’ll be integrating ChatterCast into the Geoloqi API so that the mashup can be more accessible to developers and end users. Thanks again to Tropo, Socrata, data.seattle.gov, Gnomedex and all of the great open data hackers at the #tinkerstorm hackathon event! For more about Geoloqi, and to sign up to beta test, see Geoloqi.com. If you’d like to contribute as a developer, check out the Developer Wiki. 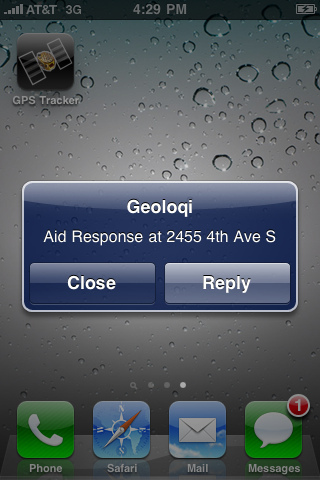 To use the rapidly developing API, try the Geoloqi API!